Little is known of the life of Leonardo Pisano that also goes by the names of Leonardo of Pisa and Leonardo Fibonacci. His life has straddled the transition between the 12th and 13th centuries but neither the date of birth or death are known exactly. Leonardo wrote several books in the very first of which Liber Abbaci (dated 1202) he included a recreational puzzle whose solution - the present day Fibonacci numbers - made his name famous in mathematical circles. Fibonacci numbers and the associated Golden Ratio have an uncanny ability to pop up rather unexpectedly in various circumstances. There is even a mathematical periodical (The Fibonacci Quarterly) that is devoted entirely to the properties of the Fibonacci numbers. Emphatically, Keith Devlin's book is not about the Fibonacci numbers. What is known of the life of Leonardo Pisano came from scarce sources. In the Prologue to Liber Abbaci Leonardo, rather uncharacteristically, provides some autobiographical details related to the circumstances of his becoming acquainted with the Indian system of numeration. There is also a record of Leonardo being summoned for an audience with the Holy Roman Emperor Frederick II sometime in the mid-1220s. In 1241, the commune of Piza granted "the discreet and learned man, Master Leonardo" an annual honorarium of twenty Pisan pounds plus expenses for services to the city. So it is known that Leonardo was alive at the time. It is not known how and when he died. Speculation as to how Leonardo ended his days ranges from his being killed in the recurrent civil strife in Pisa to him living out his days peacefully as a revered and honored citizen. That's about it. So Devlin's book is far from being a biographical exposition of Leonardo's life. A certain man buys 30 birds which are partridges, pigeons, and sparrows, for 30 denari. A partridge he buys for 3 denari, a pigeon for 2 denari, and 2 sparrows for 1 denaro, namely 1 sparrow for 1/2 denaro. It is sought how many birds he buys of each kind. The author shows solutions to this and several other word problems. However, the book is not about solving word or any other kind of problems. So, what is then the book about? The lack of biographical details makes straight chronicle of Leonardo's life impossible. ... Thus a book about Leonardo must focus on his great contribution and his intellectual legacy. ... We may not have a detailed historical record of Leonardo the man, but we have his words and ideas. Just as we can come to understand great novelists through their books or accomplished composers through their music - particularly if we understand the circumstances in which they created - so too we can come to understand Leonardo of Pisa. The rest of the book is a doggedly consistent execution of that program. Books describing the Hindu-Arab numeration have been available already in the 12th century, before the appearance of Liber Abbaci in 1202. Hundreds of similar books have been written in the next 200 hundred years. For a long time, Liber Abbaci stood apart from the pack. Not only Leonardo managed to package the new methods in a readable and understandable form, he also managed to sell the new methods to the world, thus inducing the intellectual, commercial, and scientific revolution that Devlin compares to the achievements of Galileo, Copernicus, and the invention of computers. Starting with the publication of Liber Abbaci, the system that we are using nowadays kept gaining grounds. However, it was not an altogether an easy fight. For example, in the statutes of the Arte del Cambo (Guild of Money Changes) of Florence in 1299, a proclamation forbade its members from using the new numerals. ... In 1494, the money changes in Frankfurt attempted to prohibit the use of Hindu-Arab system, persuading the city to issue an ordnance that proclaimed "the master calculators are to abstain from calculating with digits. ... Abacus board arithmetic was still dominant in northern Europe up to the end of the sixteen century. A German merchant of the fifteenth century asked an eminent professor where he should send his son for a good business education. The professor responded that German universities would be sufficient to teach the boy addition and subtraction but he would have to go to Italy to learn multiplication and division. By the end of the 15th century, mathematical authors began printing their books, while Liber Abbaci remained in the manuscript form. Leonardo's fame has waned and his name has all but disappeared from the annals of history until the manuscript has been rediscovered at the end of 18th century by Pietro Cossali. Cossali has reaffirmed the all important contribution of Leonardo in introducing the Hindo-Arabic system into the modern world. Devlin paints a broad swath of history from the 12th through the 20th century as related to the origins, education, life of Leonardo and spread of his ideas, history of commerce, rivalry between various commercial centers, Pisa, Florence, North Africa, Venice, the rest of Europe, ending with a charming adventure of Leonardo's statue during the WWII. This is a marvelously informative and well written book. It's a good read that I recommend to all curious of the history of mathematical ideas in general and the number systems in particular. 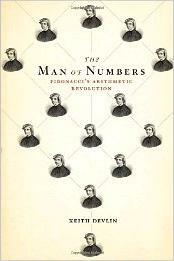 The Man of Numbers: Fibonacci's Arithmetic Revolution, by Keith Devlin. Walker & Company (July 5, 2011). Hardcover, 192 pp, $14.50. ISBN 978-0802778123.